This article is about the international umbrella organization. For its national member organizations, see Transparency International (disambiguation). Transparency International e.V. (TI) is an international non-governmental organization which is based in Berlin, Germany, and was founded in 1993. Its nonprofit purpose is to take action to combat global corruption with civil societal anti-corruption measures and to prevent criminal activities arising from corruption. It publishes for example the Global Corruption Barometer and the Corruption Perceptions Index. 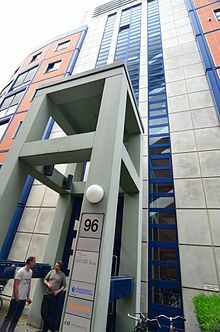 Transparency International has the legal status of a German registered voluntary association (Eingetragener Verein) and serves as an umbrella organization. Its members have grown from a few individuals to more than 100 national chapters which engage in fighting corruption in their home countries. TI confirmed the dis-accreditation of the national chapter of United States of America in 2017. According to the 2016 Global Go To Think Tank Index Report, Transparency International was number 9 of 100 in the Top Think Tanks Worldwide (non-U.S.) category and number 27 of 150 in the Top Think Tanks Worldwide (U.S. and non-U.S.) category. The organization defines corruption as the abuse of entrusted power for private gain which eventually hurts everyone who depends on the integrity of people in a position of authority. It develops tools for fighting corruption and works with other civil society organizations, companies and governments to implement them. Since 1995, Transparency International has issued an annual Corruption Perceptions Index (CPI); it also publishes a Global Corruption Report, a Global Corruption Barometer, and a Bribe Payers Index. In 2013, Transparency International published the Government Defence Anti-corruption Index with which corruption in the defence sector of 82 countries was measured. Some governments have expressed criticism towards the methodology of the report. Mark Pyman, the founder of TI's Defence & Security program, defended the report in an interview and stressed the importance of transparency in the military sector. The plan is to publish the index every two years. In 2015, Transparency International (TI) developed a five-year strategy which sets out their collective ambition for the coming years. Together against Corruption: Transparency International Strategy 2020 is a strategy by and for the Transparency International movement. This strategy is based on more than 1500 external and internal contributions addressing both the corruption environment of today and the one TI anticipates in the years ahead. The Corruption Perceptions Index (CPI) ranks countries and territories based on how corrupt their public sector is perceived to be. It is a composite index – a combination of polls – drawing on corruption-related data collected by a variety of reputable institutions. The CPI reflects the views of observers from around the world. The Corruption Perceptions Index has received criticism over the years. The main one stems from the difficulty in measuring corruption, which by definition happens behind the scenes. The Corruption Perceptions Index therefore needs to rely on third-party survey which have been criticized as potentially unreliable. Data can vary widely depending on the public perception of a country, the completeness of the surveys and the methodology used. The second issue is that data cannot be compared from year to year because Transparency International uses different methodologies and samples every year. This makes it difficult to evaluate the result of new policies. The Corruption Perceptions Index authors replied to these criticisms by reminding that the Corruption Perceptions Index is meant to measure perception and not "reality". They argue that "perceptions matter in their own right, since... firms and individuals take actions based on perceptions". Transparency International consists of chapters – locally established, independent organisations – that address corruption in their respective countries. From small bribes to large-scale looting, corruption differs from country to country. As chapters are staffed with local experts they are ideally placed to determine the priorities and approaches best suited to tackling corruption in their countries. This work ranges from visiting rural communities to provide free legal support to advising their government on policy reform. Corruption does not stop at national borders. The chapters play a crucial role in shaping its collective work and realising its regional and global goals, such as Strategy 2015. Transparency International's multi-country research and advocacy initiatives are driven by the chapters. According to its 2012 Annual Report, it is funded by western governments (with almost €5 million from the UK government) and several multinational companies, including oil companies Exxon Mobil and Shell, hedge funds KKR and Wermuth Asset Management, Deloitte and Ernst & Young. It does not however seem to affect their practices, as Exxon Mobil itself was ranked in 2008 as the least transparent of 42 major oil and gas firms. As far as organizational structure is concerned, one important leadership structure is their advisory council. The Advisory Council is a group of individuals with extensive experience in the areas of Transparency International's work. They come from diverse geographical, cultural and professional backgrounds. The council is appointed by the Board of Directors to advise them and to support the work of the organisation as a whole. Transparency International was founded in May 1993. According to political scientist Ellen Gutterman, "TI's presence in Germany, and indeed its organizational development and rise from a small operation to a prominent international TNGO, benefited from the activities and personal, elite connections of at least three key German individuals: Peter Eigen, Hansjoerg Elshorst, and Michael Wiehen". Peter Eigen, a former regional director for the World Bank, is recognized as a founder, along with others. Michael Wiehen was a World Bank official at Washington, D.C. Hansjörg Elshorst was managing director of the Deutsche Gesellschaft für Technische Zusammenarbeit (GTZ) (German Agency for Technical Cooperation). Other founding board members included John Githongo (former Permanent Secretary for Ethics and Governance in the office of the President, Kenya), General Electric lawyer Fritz Heimann, Michael J. Hershman of the U.S. military intelligence establishment (now President and CEO of the Fairfax Group), Kamal Hossain (Bangladesh's former Minister of Foreign Affairs), Dolores L. Español (the Philippines' former presiding Judge of Regional Trial Court), George Moody Stuart (sugar industrialist), Gerald Parfitt (Coopers & Lybrand, then PricewaterhouseCoopers in Ukraine), Jeremy Pope (New Zealand activist and writer), and Frank Vogl, a senior official at the World Bank and head of Vogl Communications, Inc., which has "provided advice to leaders of international finance". In 1995, Transparency International developed the Corruption Perceptions Index (CPI). The CPI ranked nations on the prevalence of corruption within each country, based upon surveys of business people. The CPI was subsequently published annually. It was criticized for poor methodology and unfair treatment of developing nations, while also being praised for highlighting corruption and embarrassing governments. In 1999, Transparency International began publishing the Bribe Payers Index (BPI) which ranked nations according to the prevalence that a country's multinational corporations would offer bribes. Transparency International produces the Global Corruption Report which picks a specific topic like corruption in climate change for example and provides in-depth research. National integrity system assessments are designed to provide comprehensive analysis on a given country's mechanisms to fight corruption. At its annual meeting in November 2013 in Berlin, Transparency International's national chapters from Germany and Ireland proposed a resolution calling for the "end of the prosecution of Edward J. Snowden... He should be recognized as a whistleblower for his help to reveal the over-reaching and unlawful surveillance by secret services... He symbolizes the courage of numerous other whistleblowers around the world." The final resolution that was passed by the plenary excluded any reference to Snowden, and excluded a call for "comprehensive protection on whistleblowers from all forms of retaliation". The original resolution presented by the German and Irish chapters was weakened following the intervention of Transparency International's American chapter, TI-USA. "The whistleblower resolution was watered down by the US delegation," a TI insider was quoted in an article published by the Huffington Post. "TI USA is very corporate oriented, very inside the Beltway oriented." Five months earlier, in June 2013, representatives from Transparency International declined Snowden's request to meet him at the Moscow airport. Amnesty International and Human Rights Watch met Snowden to support his asylum request, but Transparency International refused. In January 2015 it was reported that Transparency International (TI) accepted $3 million from the German engineering multinational Siemens, which in 2008 paid one of the largest corporate corruption fines in history – $1.6 billion – for bribing government officials in numerous countries. Transparency International applied for and received the money from Siemens, even though TI's due diligence procedures prohibit the organization from accepting money from corporations that want to "greenwash" their reputations by making donations to TI. "If any corporate donor is accused of having been involved in corruption, the donor can expect no protection from TI," the procedures state. Transparency International received the money from the Siemens Integrity Initiative about a year after the Initiative hired former TI staffer Jana Mittermaier, raising questions of a "revolving door" that has benefited both the organization and the company. Several of TI's national chapters also have accepted money from Siemens: $660,000 for TI USA, $600,000 for TI Italy, $450,000 for TI Bulgaria, and $230,000 for TI Mexico – each for a period of three years. "This really shows that Transparency International is not as pure as people think," a TI insider told Corporate Crime Reporter. Transparency International Managing Director Cobus de Swardt said, "We did not file an application to Siemens, we applied to the Siemens Integrity Initiative. There's a difference. We have not applied to Siemens." However, according to Siemens, the money for these grants is "provided by Siemens." In January 2017, the TI Secretariat confirmed that its International Board of Directors decided on 10 January 2017 to strip its US affiliate – Transparency International USA – of its accreditation as the National Chapter in the United States. Transparency International USA joins Transparency Croatia in having its credentials stripped. The stated basis for the dis-accreditation was the board's recognition of differences in philosophies, strategies, and priorities between the former chapter and the Transparency International Movement. Elsewhere, it was reported that TI-USA came to be seen in the United States as a corporate front group, funded by multinational corporations – the same multinationals that corrupt the U.S. political system. TI-USA's million-dollar budget was provided by Bechtel Corporation, Deloitte, Google, Pfizer ($50,000 or more), Citigroup, ExxonMobil, Fluor, General Electric, Lockheed Martin, Marsh & McLennan, PepsiCo, PricewaterhouseCoopers, Raytheon, Realogy, Tyco ($25,000–$49,999), and Freeport-McMoRan and Johnson & Johnson (up to $24,999). TI-USA previously awarded an annual corporate leadership award to one of its big corporate funders. In 2016, this award went to Bechtel. In April 2015 TI defended the decision by its American chapter, TI-USA, to give Hillary Clinton its Integrity Award in 2012. TI's statement followed a report by National Public Radio that Bill and Chelsea Clinton were not factual regarding the transparency of the Clinton Foundation. Due to a "lack of confidence", TI's chapter in Croatia was disaccredited by the organization's board of directors in November 2015. The previous year, several leaders of the Croatia chapter challenged the legality of the chapter president's election. The president was accused of falsifying records, conflicts of interest, and arbitrarily expelling 10 chapter members who opposed the hiring of staff against the organization's rules. The Croatian government eventually revoked the president's appointment. Transparency International has come under intense criticism for accepting millions of dollars from companies that have engaged in bribery. In 2014, Siemens donated $3 million to Transparency International after pleading guilty in 2008 to bribery charges in which it paid more than $1.6 billion in penalties relating to widespread corrupt practices in Greece, Norway, Iraq, Vietnam, Italy, Israel, Argentina, Venezuela, China and Russia. Transparency International's policy forbids accepting money from corrupt companies. In January 2016 a dispute arose regarding TI's chapter in New Zealand. The Governance Director in TI's Berlin headquarters sought to block an ethics complaint filed against the chapter's board chair by preventing the complaint from being heard by the Berlin office. The Governance Director also submitted an affidavit challenging a New Zealand court's jurisdiction to hear the case. In August 2015 former TI staffer Anna Buzzoni went public regarding retaliation she and her colleagues faced after reporting to managers questionable financial dealings at TI's Water Integrity Network. Two of Buzzoni's project responsibilities were suspended and she was transferred against her will. She left TI shortly before internal whistleblower guidelines were adopted in June 2014. ^ e.V., Transparency International. "Our impact - Transparency International". www.transparency.org. ^ Transparency International e.V. "Our Organisation – overview". transparency.org. ^ e.V., Transparency International. "Transparency International confirms the disaccreditation of its chapter in the US". ^ James G. McGann (Director) (February 4, 2015). "2014 Global Go To Think Tank Index Report". Retrieved February 14, 2015. Other "Top Think Tank" rankings include #7 (of 80) in Top Think Tanks in Western Europe, #13 (of 85) in Foreign Policy and International Affairs Think Tanks, #1 (of 40) in Transparency and Good Governance Think Tanks, #2 (of 75) for Best Advocacy Campaign, #42 (of 65) for Best Managed Think Tanks, #10 (of 60) for Best Use of Social Networks, #8 (of 60) of Think Tanks with the Best External Relations/Public Engagement Program, #4 (of 40) for Best Use of the Internet, #9 (of 40) for Best Use of Media, and #10 (of 70) for the Most Significant Impact on Public Policy, #8 (of 60) of Think Tanks with Outstanding Policy-Oriented Public Programs. ^ Transparency International e.V. "Transparency International – What we do". transparency.org. ^ "Government Defence Anti-corruption Index". Transparency International. 2013. Archived from the original on 2013-05-08. ^ Transparency International e.V. "2015 Strategy". transparency.org. ^ Transparency International e.V. "2020 Strategy". transparency.org. ^ Transparency International e.V. "2012 Corruption Perceptions Index – In detail". transparency.org. ^ "A Users' Guide to Measuring Corruption". Global Integrity & UNDP. Archived from the original on 2011-01-31. ^ Uslaner, Eric M. (2008). Corruption, inequality, and the rule of law: the bulging pocket makes the easy life. Cambridge University Press. pp. 11–17. ISBN 0-521-87489-0. ^ e.V., Transparency International. "TI Publication - Annual Report 2012". Retrieved 16 November 2016. ^ "BBC NEWS - Business - Exxon 'ranks low on transparency'". Retrieved 16 November 2016. ^ "Advisory Council". Retrieved 1 April 2019. ^ a b Ellen Gutterman (June 2012). "The Legitimacy of Transnational NGOs: Lessons from the Experience of Transparency International in Germany and France (PDF)" (PDF). Paper submitted to the 84th annual conference of the Canadian Political Science Association. ^ "Michael Wiehen - Partnership for Transparency Fund". ^ a b c "Advisory Council". Transparency.org. ^ "CEWS - Panelist Biographies - Butler". Archived from the original on 17 November 2015. Retrieved 16 November 2016. ^ "Senior Division Leaders: Michael J. Hershman". Fairfax Group. ^ "George Moody Stuart obituary". The Times. November 24, 2004. ^ "Protected Blog › Log in". Retrieved 16 November 2016. ^ "Frank Vogl - The Huffington Post". Retrieved 16 November 2016. ^ Hicks, Bill (2010). "Transparency International". Pinkindustry.com. ^ Larmour, Peter (September 2006). Bowden, Brett (ed.). Global standards of market civilization. Routledge. pp. 95–106. ISBN 0-415-37545-2. ^ a b Chaikin, David (June 2009). Corruption and money laundering: a symbiotic relationship. Palgrave Macmillan. pp. 12–13. ISBN 0-230-61360-8. ^ e.V, Transparency International. "Global Corruption Barometer: citizens' voices from around the world". www.transparency.org. Retrieved 23 April 2019. ^ "Research - GCR - Overview". www.transparency.org. ^ "What we do - National integrity system assessments". www.transparency.org. ^ Editor, Russell Mokhiber; Reporter, Corporate Crime (10 February 2014). "Transparency International Nixes Edward Snowden". Retrieved 16 November 2016. ^ Lichtblau, Eric; Dougherty, Carter (15 December 2008). "Settling Bribery Case to Cost Siemens $1.6 Billion" – via NYTimes.com. ^ "Private-Sector Donors Approval and Due Diligence Processes" (PDF). ^ "Transparency International Siemens Revolving Door Spins, Money Pipeline Flows - Corporate Crime Reporter". 11 February 2014. Retrieved 16 November 2016. ^ "Transparency International and the Greenwashing of Siemens - Corporate Crime Reporter". 2 April 2014. Retrieved 16 November 2016. ^ "Siemens Donates $3 Million to Transparency International - Corporate Crime Reporter". 21 January 2015. Retrieved 16 November 2016. ^ a b "Transparency International Strips United States Affiliate of Accreditation - Corporate Crime Reporter". 19 January 2017. ^ e.V., Transparency International. "Press release - Transparency and The Clinton Foundation: Regarding recent statements". Retrieved 16 November 2016. ^ "NPR Exposes Holes in Chelsea and Bill Clinton's 'Most Transparent Foundation' Boasts". Retrieved 16 November 2016. ^ e.V., Transparency International. "Press release - Transparency International statement on its former chapter in Croatia". Retrieved 16 November 2016. ^ Ognian Shentov; Ruslan Stefanov; Boyko Todorov, eds. (2014). "Anti-Corruption Reloaded Assessment of Southeast Europe" (PDF). Southeast Europe Leadership for Development and Integrity. ISBN 978-954-477-221-5. ^ "Press Release: SEC Charges Siemens AG for Engaging in Worldwide Bribery; 2008-294; Dec. 15, 2008". www.SEC.gov. ^ "Stan Cutzach's Governance of Transparency International Hits New Zealand - Kiwisfirst". 12 January 2016. Retrieved 16 November 2016. ^ "Home page - WIN - Water Integrity Network". WIN - Water Integrity Network. ^ "Falling on Deaf Ears". 27 August 2015. Retrieved 16 November 2016. This page is based on the Wikipedia article Transparency International; it is used under the Creative Commons Attribution-ShareAlike 3.0 Unported License (CC-BY-SA). You may redistribute it, verbatim or modified, providing that you comply with the terms of the CC-BY-SA.